Golf In Sync is a training tool primarily for your short game, which helps you perform a synchronized swing where the power generated comes from body rotation. In this type of swing, the arms, hands and club follow the body motion rather than being used to try and guide the club themselves. Golf In Sync can also be used for full swing training where it is easy to see the shaft plane (demo video/shaftplane) and for length of the backswing. 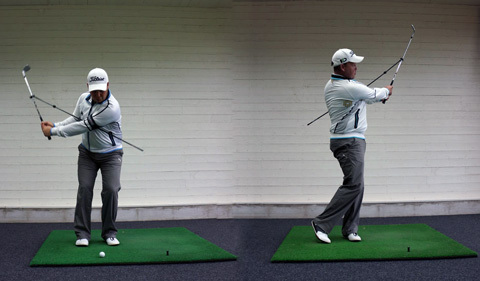 Golf In Sync facilitates the player's own understanding of repeating a swing movement during training. If you have any questions regarding the Golf in Sync Swing Trainer, please give us a call, we would be happy to help you with any questions you may have. 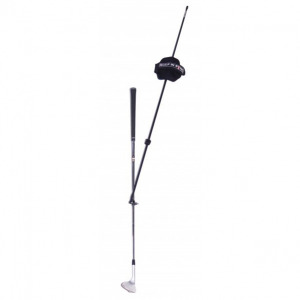 Write an online review on the Golf in Sync Swing Trainer, and share your thoughts with others.